On the same day that President Obama announced his endorsement of The Equality Act — a federal bill that would amend the 1964 Civil Rights Act to ban discrimination on the basis of sexual orientation or gender identity — the Dallas City Council voted unanimously to clarify language in its equal rights ordinance to better protect the transgender community. Gender identity protections have been part of the Dallas equal rights ordinance since it passed 13 years ago in 2002. Yet immediately after the uncontroversial passage of this clarifying language, the same fear mongering, baseless, transphobic “bathroom” lies that ultimately lead to the repeal the Houston Equal Rights Ordinance resurfaced. We know that the fight for LGBTQ equality is far from over in Texas. GOP lies aimed at discriminating against gay and transgender Texans must be stopped. As we saw in Houston, their dangerous rhetoric has real consequences. Lieutenant Governor Dan Patrick, a devout proponent of "local control," who invested and appeared in ads for the campaign to repeal the Houston ordinance, issued a statement "on Dallas Bathroom Ordinance” chalked full of the same, totally debunked lies. Houston voters soundly said NO to men in women’s bathrooms. 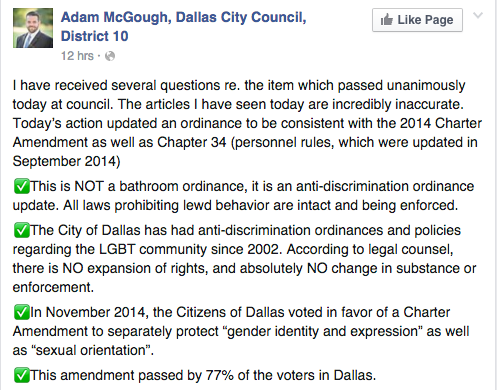 Dallas’ new sneak-attack LGBT ordinance must be repealed & carefully reviewed.